(Bloomberg) -- Telecom Italia SpA abandoned a debt-reduction target and plans to write down the value of its assets by about 2 billion euros ($2.3 billion), highlighting competitive pressures facing the former monopoly. The double dose of bad news underscores the challenge facing Chief Executive Officer Amos Genish, who has been trying to revive the debt-ridden company under pressure from a U.S. activist shareholder. Telecom Italia hasn’t paid a dividend on its ordinary shares since 2013 and is having to spend billions of euros on frequencies for faster 5G mobile services. The carrier’s biggest shareholder Vivendi SA brought in Genish in September last year only for the French company to lose control of the board to U.S. activist Elliott Management Corp. and its allies in May. The 57-year-old Israeli former army captain has walked a tight rope ever since. Telecom Italia shares fell 3.8 percent to 0.52 euros at 9:28 a.m. in Milan, bringing their decline this year to 28 percent and pushing down the company’s market value to 10.6 billion euros. That makes the struggling telecommunications giant worth less than steel pipe manufacturer Tenaris SA and niche carmaker Ferrari NV. Telecom Italia’s 1.25 billion euros of bonds due October 2027 dropped 1 cent on the euro to 89.5 cents, the lowest level since they were issued a year ago, according to data compiled by Bloomberg. Vivendi was quick to criticize the Telecom Italia writedown, saying the move was “sudden and unusual” and would weigh heavily on its share price. 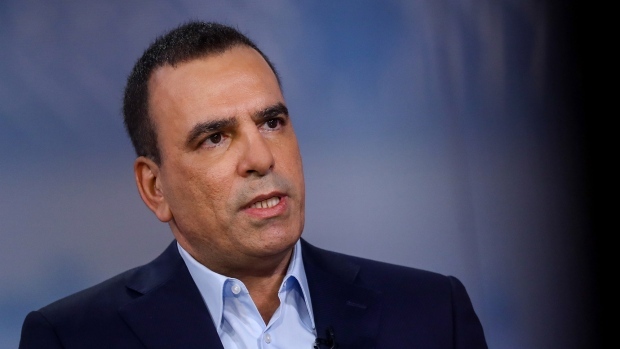 Telecom Italia’s mobile business is facing a challenge from a new low-cost rival, Iliad SA, just as it gears up for heavy investments in fifth-generation networks. Its cash-rich fixed-line division is under assault from state-backed Open Fiber SpA, which has rolled out a high-speed optic fiber network of its own. Open Fiber is a joint venture between state-controlled utility Enel SpA and state lender Cassa Depositi e Prestiti. Genish is trying to head off that threat by proposing a partnership with Open Fiber in which Telecom Italia would lease network capacity from its rival, especially in rural areas, people with knowledge of the matter told Bloomberg on Thursday. Without such a deal, Telecom Italia could find it hard to build the infrastructure to satisfy soaring demand for data traffic and still turn a profit. The carrier’s directors also on Thursday approved a a nonbinding offer for Nextel Telecomunicacoes Ltda, people familiar with the matter said, a move that would help the carrier gain market share and airwaves in Brazil. Telecom Italia shares rose as much as 4.3 percent on the Open Fiber report before closing up 1.4 percent in Milan ahead of third-quarter results that were in line with company-compiled analyst forecasts. Genish’s future at Telecom Italia has been uncertain since people familiar with the matter told Bloomberg in September that board directors representing Elliott had grown more impatient over his handling of the company. Elliott is the second-largest shareholder of Telecom Italia. He has focused on growing the business organically, while the U.S. activist investor wants him to make changes like selling a stake in its towers company and a full spinoff of the fixed-line network, the people said at the time. The company it would not meet its 2018 goal for debt to represent 2.7 times earnings before interest, tax, depreciation and amortization, excluding mobile spectrum costs. It blamed a government fine and “the adverse competitive and regulatory environment in the domestic business.” It also cited the weakening Brazilian exchange rate which has hit income from its biggest overseas division. Still, the carrier’s third-quarter operating results showed strength in its domestic market, where sales beat analysts’ expectations. Italian mobile service revenues were much better than expectations during the first full quarter since Iliad’s entry, Dhananjay Mirchandani, an analyst at Berenberg, wrote in a note. Bloomberg reported the asset writedown plan before the results. Several financial analysts who cover Telecom Italia have previously valued its fixed-line business alone at around 15 billion euros. --With assistance from Angelina Rascouet and Luca Casiraghi.